Union Ministry of Railways on 27th October 2018, has announced that it is planning to build the World's Highest Railway Line to link New Delhi and Ladakh that will run along the India-China Border. The proposed new railway line project-Bilaspur-Manali-Leh Line would be the world’s highest railway line once constructed and get operational. The proposed new 465 km railway line is estimated with a construction cost will be Rs 83,360 crore. The railway line project will be the world’s highest at 5,360 meters above mean sea level which is comparable to China’s Quinghai-Tibet Railway Line at 2,000 meters. The railway line project comprises 74 tunnels, 124 major bridges, 396 minor bridges and 30 stations on the line. The railway line project key stations on the route will be constructed inside a tunnel at the height of 3000 meters which is a first in India. Also, more than half the train route would be covered through tunnels, the longest of which is 27 km. The whole length of the tunnels would be 244 km. The route will link crucial locations between Bilaspur and Leh such as Sundernagar, Mandi, Manali, Keylong, Koksar, Darcha, Upshi, and Karu as well as several other towns of Himachal Pradesh and Jammu & Kashmir. After the completion, the railway line will halve the time taken to cover the distance between Delhi and Leh from the current 40 hrs to 20 hrs. 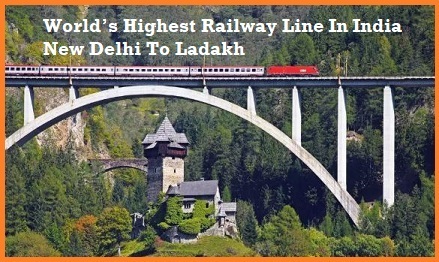 Besides, the railway line would quick all-weather access to the armed forces, the railway line will also enhance tourism in the Ladakh region that is presently connected by road and air. The Ladakh-Himachal areas receive heavy snowfall and the road and air connectivity.